In this week’s blog Dr Jonathan Conlin discusses a group visit by undergraduate History students to the Special Collections. From the slightly soapy feel of vellum to the sweet smell of laid paper, seventeenth- and eighteenth-century archives are a feast for all the senses, not just sight. This week eight third-year history undergraduates joined me at Special Collections for a hands-on session looking at the economic life of eighteenth-century Britain and Ireland. The visit formed part of a year-long Special Subject addressing the great economic thinker Adam Smith (1723-90). In first semester we engage in a lot of close reading of Smith, in search of tools to help us answer the big questions: what is wealth? what is happiness? how can a process of development Smith called “the progress of opulence” make us better as well as richer human beings? Smith’s world can be an alien place, however. Special Collections allows us to touch, smell and even read vestiges of the trading activities which we discuss in the seminar room, week-in, week-out. 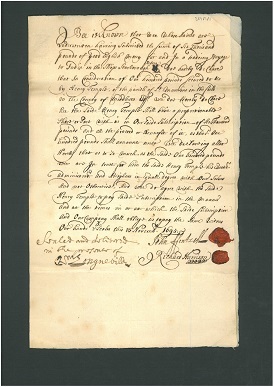 Starting with grand adventures in pursuit of profit, a 1695 contract [MS 62 Broadlands Archives BR4/1/1] records Henry Temple’s £100 stake in a £6,000 entreprise: a round-trip voyage to India. Worth around £14,000 today, this was a significant investment in the cargo of two ships, the Scarborough and Rebecca, who would probably have returned with spices and printed cottons. Over the following century the Industrial Revolution would see such chintzes being woven at home in Britain, on machines, rather than handlooms – a process which in turn helped bring about the “Great Divergence” in the economic fortunes of Europe and Asia. These are all big questions we return to again and again in the course. Holding the paper in your hand, however, more urgent questions spring to mind: did the ships complete their perilous journey? Fifteen years on and the War of Austrian Succession has broken out, with Britain and her allies fighting France in Spain and elsewhere. 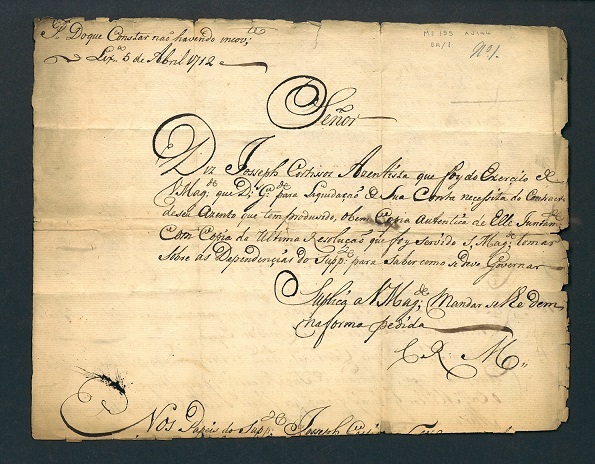 For government contractors like Joseph Cortissos there was no business like war business: large fortunes were to be made supplying armies in the field with donkeys, wine, horses, bread and other goods. Given the healthy margins, competition was tough, and Cortissos (a former diplomat) would have had to pull every string in his reach to get this prize. Written in Portuguese and English, his accounts of goods provided to allied English and Portuguese armies [MS 155 AJ144/5A] are clearly working documents, as the columns of scribbled sums on the back attest. Contracting was a risky business, however, and just as controversial as it is today in warzones like Iraq (heard of Halliburton, anyone?). Cortissos’ bills were never fully paid. A collection of papers [MS 64/3] from Portlaoise (Ireland) dating from the late 1770s shows the grubbier side of Georgian “democracy” in all its glory. The Irish parliamentary seat had been controlled by the Earls of Drogheda, but in 1776 control partly passed to the Parnell family, whose papers are at Southampton. “Management” of elections required keeping close tabs on voters. Voters had first to be created: any Freeman of the Corporation could vote, so borough patrons simply created hundreds of (hopefully!) loyal voters, men (women did not get a look in) who could be trusted to place their vote (in public – no secret ballot then) for the right candidate. 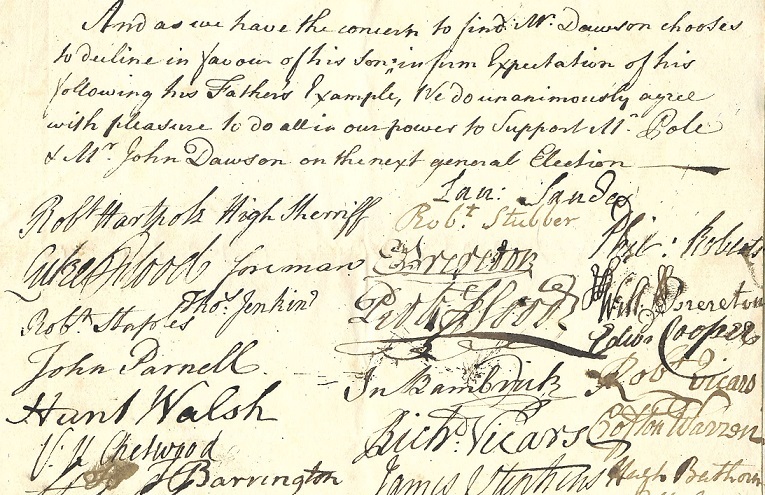 Once created, voters had to be watched, as long lists of votes with worried crosses next to the names of voters considered “doubtful” demonstrate. This machine ran on patronage, outright bribery and lots and lots of beer, consumed by the barrel over the week-long poll. Political life was lively and everyone had their part to play: but was it democracy? And so to the vellum. Tucked at the back of the file is a long thin strip of vellum with what appears to be a list of names partly discernable on it. This clearly is (or rather was) a roll; you can see the join where the sheets of vellum were stitched together. But where is the rest? Is this the electoral roll of the borough? If so, why is it here in Southampton? Someone seems to have snatched it and then attempted to shred it. Why? And, having lost most of it, why did they keep one long, narrow, twisted piece? As a relic? A prize? The most exciting finds are those which defy description. Dr Jonathan Conlin teaches modern history at the University of Southampton. His books include a biography of Adam Smith, for Reaktion’s Critical Lives series.